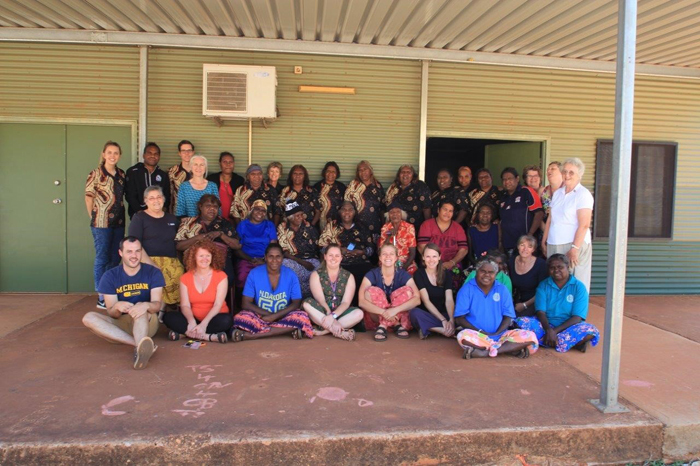 Lajamanu recently hosted a four day annual workshop for more than 40 staff from Warlpiri bilingual schools. The Warlpiri Triangle Professional Learning Community event included delegates from Yuendumu School, Lajamanu School, Willowra School and the OLSH campus at Wadeye. Teaching teams involved in the Indigenous Languages and Culture program identified learning stages for students, planned future assessments and programs, and methods of teaching reading. The forum was an opportunity to strengthen bilingual programs in schools, record songs for classes, develop teaching resources, and reinforce partnerships with agencies such as the Warlpiri Education Training Trust, Central Land Council rangers, and the Warlpiri Youth Development Aboriginal Corporation. Workshop participants will continue the cycles of the Collaborative Impact Program in their schools.